An IVR Recording Enhances Your Caller Navigation! For a business to step ahead of their competitors and to make its presence differently in the market, you need a toll-free number that offers IVR recording. An IVR recording is like a front door to your business – it’s the first thing callers hear and people see. Whenever a caller calls you, he will be greeted by an IVR message which plays based on the recording you want. When you call a company says XYZ, a recording gets played on the phone. This recording is like a welcome message which a caller hears when he calls your company. This welcome message makes the caller feel good about your company and forms a good image. After you hear the welcome message, then you get to hear about the features of the company, followed by the different numbers and to whom you want to connect. Like, the IVR greeting will ask you to press different numbers to connect to the different agents. When all the query and problems are solved and you finally got the reply what you are looking for. Then, before the call gets end – you hear a thank you message that sends you extra information about the company and thanks to you for making the call. These are the three ways and steps of greetings which a caller listens when he calls your company. An IVR recording should never be decided just like that, but you should focus on the IVR script very well and doesn’t make a script without analyzing it well. If you are in a confused state about what things to include while recording your IVR, you should plan very carefully and look on the if’s and don’ts. The first thing you should focus on is that your greeting should be well-scripted having just the main choices. By offering fewer choices, the caller doesn’t get confused and easily select his choice. A long list of the department makes difficult for the caller to navigate what he wants. The simple your IVR recording will be, the more it will attract callers to connect with you. Always remember, that customer wants to reach you as fast as possible. So, make sure your IVR script delivers that. 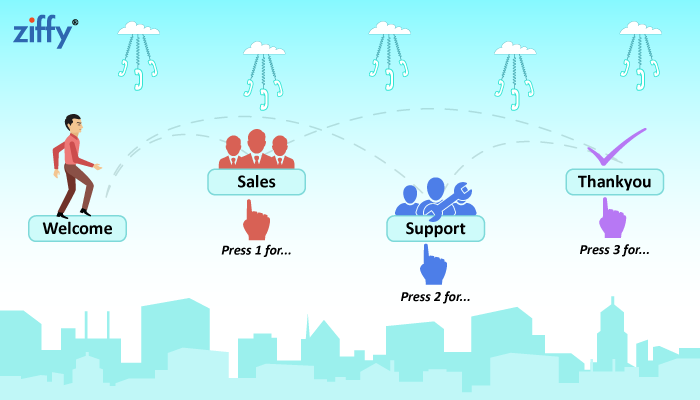 It is difficult to automate caller with every aspect of a customer transaction. When a caller calls you most of them wish to talk to an agent and explain them their query. When you are deciding your IVR script, ensure that you provide the chance to talk to your agent. Everyone knows how frustrating it is to be presented with endless menus and options, which makes caller gets confused that which option to choose to speak to an ideal agent. To talk to an agent on a toll-free number can be time-consuming as the caller has to wait on the phone-line for a longer duration before connecting the agent. A long wait on hold without interruption can make caller assume that they have become lost the connection. If you will add a hold music on the call and in between after every interval a courtesy message can reassure callers that they are in the waiting line and will be contacted soon. Do you still use the word dial in the age of touchscreen smartphone? Well, if you still do, then you should change the word ‘dial’ from ‘press’. There are chances that ‘touch’ could be the new word to use but to be the safe sight you can always use the word ‘press’ to be clear. These methods will definitely solve all your query of how to script your IVR and you can easily navigate your caller. What is the cost of getting Toll Free number in India? in "Cloud Telephony, IVR, Toll Free Incoming"
in "General, Toll Free Incoming"
Next Next post: Which Toll-free Number is Right For Your Business?